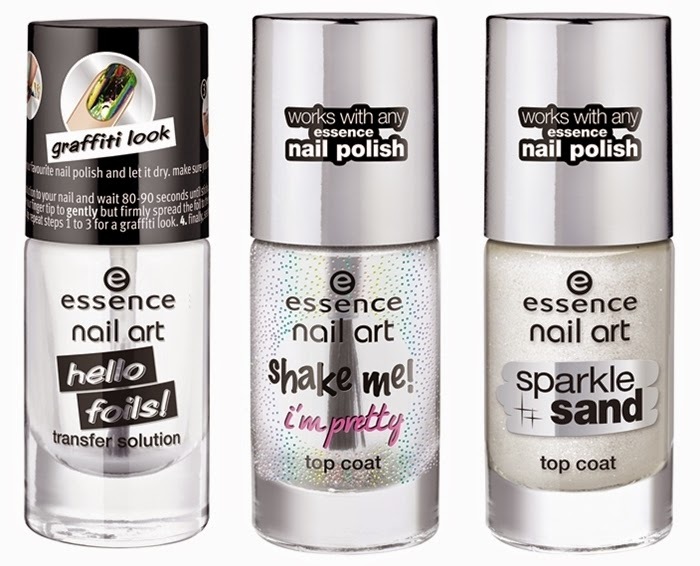 The Polish Jinx: New Essence Hello Foils! Yes, more new Essence stuff! I think these posts are going to be never ending over the next few days. Fabulous foils! 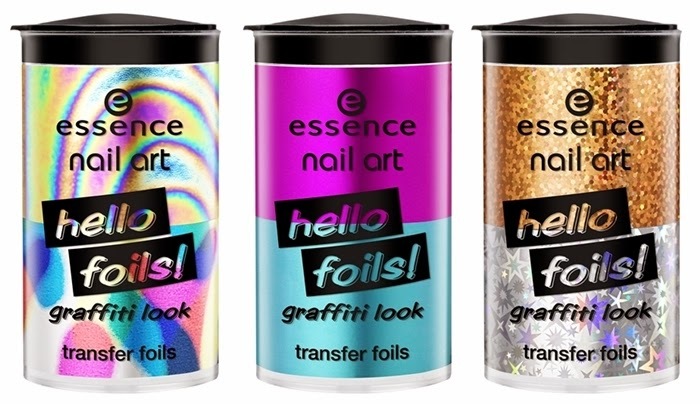 These nail foils bring cool graffiti styles straight to your nails in the most fashionable effects –holographic, metallic and glittering. And here’s how it works: apply the transfer solution on your nails and wait for 80-90 seconds. Separate a piece of the foil and press it onto your nail with the shiny side up. Remove the foil again and seal with a top coat –and you’re done! Repeat this step for each nail. Totally creative and unique! Transfer foils are available in a total of three versions. essence nail art sparkle sand topcoat - Super sand style! This top coat with an innovative sand effect is a true must-have. Apply your favorite nail polish, leave to dry and then apply the sand top coat on top to give any color a fantastic, slightly matt 3D structure with subtle shimmer particles. essence nail art shake me! I’m pretty top coat (european exlusive to Miller Stores) - Shake it! The name of this top coat says it all. Simply shake the bottle of shake me! i’mpretty top coat to mix the cool holographic glitter particles with the texture. Apply the top coat over any nail polish for an extra portion of bling.